NEW YORK It certainly speaks volumes for New Order's enduring popularity that the band could go on hiatus for several years, and then reunite for a tour that can attract a huge audience. At least that was the case on Thursday night, when the influential band from Manchester, England, played to a packed audience at New York City's Roseland Ballroom. New Order's visit to the Big Apple, its first in seven years, is significant in two ways: 1) It was part of the band's first North American tour in seven years; and 2) It is the first New Order tour without founding bassist Peter Hook. This lineup consisted of original members Bernard Sumner (vocals and guitar), Stephen Morris (drums) and Gillian Gilbert (keyboards), augmented by Phil Cunningham (guitar) and Tom Chapman (bass). With no new album to promote, there was little doubt that the set list for this tour would consist of mainly hits and popular favorites from New Order's back catalog. And New Order did not disappoint as far as its selection of songs that verged between the post-punk sound of the group's early years (the band started in 1980 after the suicide of singer Ian Curtis from previous band Joy Division); and through its electronic-influenced dance rock into the early '80s and beyond. It was nothing but classic New Order songs from the set list, such as "Ceremony," "Age of Consent," "Love Vigilantes," and the hypnotic "Bizarre Love Triangle." New Order even dug really deep into its catalog with with such tracks as "Your Silent Face" and "5-8-6" off of the band's 1983 album, "Power, Corruption and Lies." Then the band unleashed some of its bigger hits towards the end of the set with "True Faith"; the dazzling "Perfect Kiss"; and the iconic dance hit "Blue Monday." New Order ended the set on a triumphant and high note with "Temptation," which absolutely rocked. 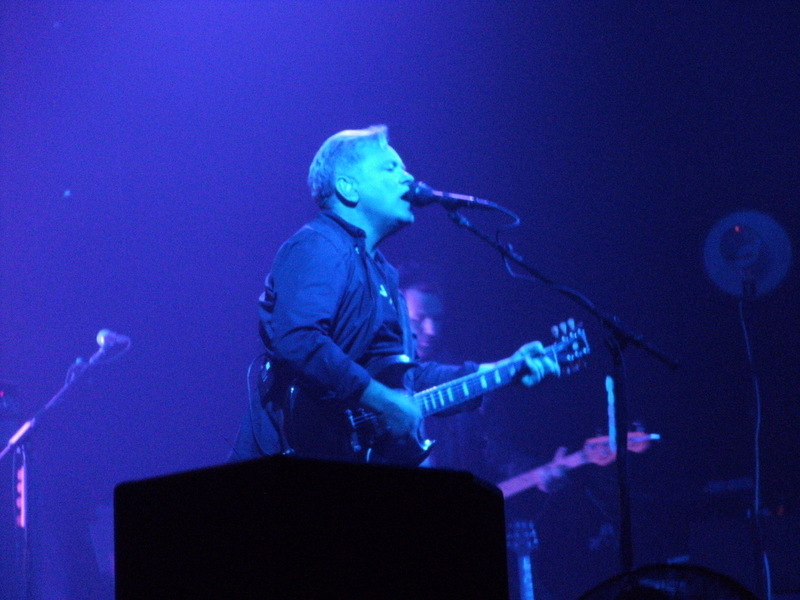 For the encore, New Order paid tribute to its previous incarnation as Joy Division with two songs that were originally recorded by that band: the very haunting "Atmosphere" (the projection on the screen behind the band showed images of the late Ian Curtis); and the classic "Love Will Tear Us Apart." The performances from all of the New Order members at the show were rock solid and tight. Former New Order bassist Hook's absence was felt throughout the show; his melodic bass lines were so crucial to the band's sound. (Hook is currently leading his own band and has also recently published a book about Joy Division). So in a sense, his replacement, Chapman, had some big shoes to fill. Fortunately he rose to the challenge and came through quite admirably -- at times, his bass playing echoed his predecessor's. New Order finishes its North American tour on Oct. 23 in Toronto. If you look at the band members' history -- they split up, go on a hiatus, reunite and then split up again. But anytime they do get together for something like a new album, or in this case a reunion tour, it definitely warrants interest and attention. The large crowd that was there to see them at Roseland could certainly vouch for that.